For all that is chat related. ← Chat codes you can remember! How to triforce and post blank status updates on facebook! The method used in the article by knowyourmeme works on almost all webpages, but not in facebook comments and facebook statuses. It does however work in the facebook chat! Now, the problem is that the character alt+255 alone only works in the facebook chat, and not in comments/status updates, and thus using this method will make you looks like a newfag. The solution is to find a new invisible character that has not (yet) been disabled in the facebook comments/status updates. This entry was posted in Chat Codes and tagged alt+0005, alt+255, chat, code, codes, facebook, firefox, google, google chrome, smiley, smileys, turboelgo, turbolego, turbolego.com/ninja.txt, turbolego.com/triforce.txt. Bookmark the permalink. 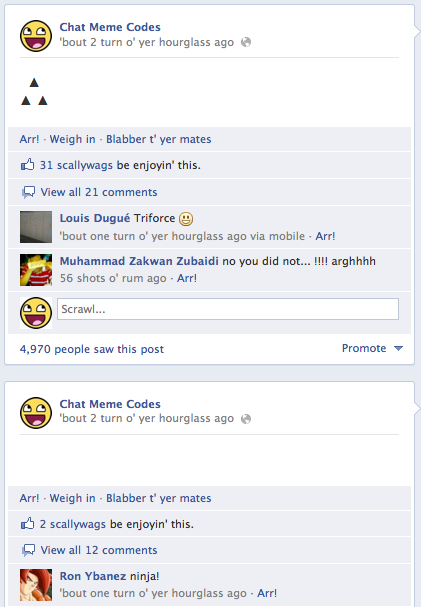 19 Responses to How to triforce and post blank status updates on facebook! This blog is dedicated to anything related to facebook chat codes. Extension update and faster installation for Google Chrome! ChatCodes in the google plus chat! More updates on the latest extension! triforceone on How to triforce and post blank status updates on facebook! Adam Wallace on How to triforce and post blank status updates on facebook! Kernak :v on How to triforce and post blank status updates on facebook!